In 1982, Remco introduced the Official Sgt. Rock action figure toy line, based on the fictional DC Comics character of the same name. Sgt. Franklin “Frank” John Rock was a World War II veteran who fought with his unit, Easy Company in the infantry branch of the U.S. Army. Sgt. Rock made his first appearance in DC’s Our Army at War #83 (June 1959) and became so popular that the comic book series was renamed Sgt. Rock with issue #302 (Mar 1977). The final issue of the series (#422) hit comic book sales racks in June 1988. Each action figure stood 3 ¾” tall and offered the limited articulation found in many of the other action figures of the same era. Many of the action figures also included an iron-on military patch or a plastic dog tag, complete with a random serial number and space for children to write their name and rank, as part of the packaging. Advertisements for the action figures and related playsets were placed in comic books. Even though the toys were based on a popular comic book character and ads were strategically placed in related comic books, the toy line not very well received by fans of the series and was marketed for only a short period before it was canceled. So, why did this happen? The primary reasons for failure were inattention to detail regarding the source material and the generic aspect of the toy line itself. Although the Sgt. Rock comic book series was set during World War II, the action figures were outfitted in uniforms and weapons with a more modern look. Fans of the comics expected Sgt. Rock to be dressed in World War II-era attire and to have his standard Thompson submachine gun instead of the Vietnam-era fatigues and M16 rifle that were included with the action figure. While Hasbro’s G.I. Joe: A Real American Hero toy line offered unique characters with varying backgrounds to help foster children’s imaginations, the action figures in the Sgt. Rock line contained basic soldiers with plain uniforms that didn’t stand out amongst the competition. Unique characters that appeared in the comics, such as Wildman, Ice Cream Soldier, and Little Sure Shot were replaced with bland looking counterparts with names like Leatherneck, Marksman, Military Police, and Ranger. Remco also produced a few Sgt. 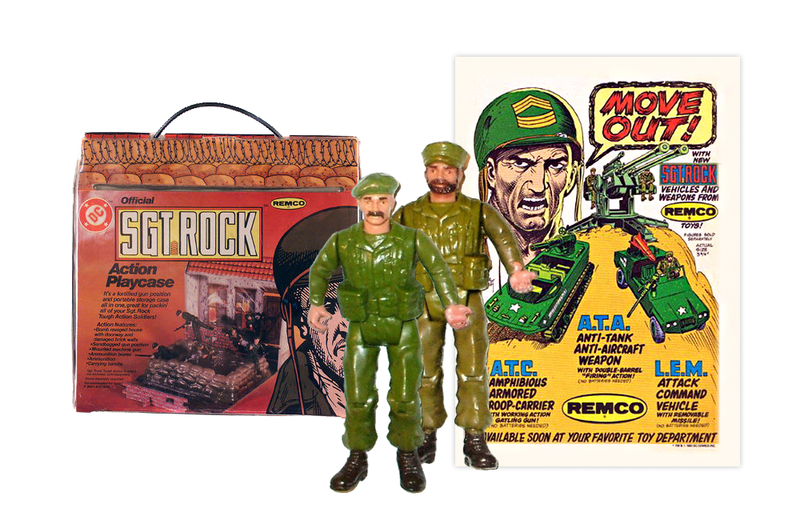 Rock playsets, including the Action Playcase (a combination action figure carrying case/playset) and the Action Machine Gun Nest. Unfortunately, these add-ons were also generic and could have been produced for any military-based toy line. While Hasbro’s G.I. Joe line became one of the most popular toy lines of the 1980s and remains popular with fans and collectors to this day. Remco’s counterpart has been relegated to niche status with collectors. Ed Lute is an educator, geek, and freelance writer whose work has appeared in BACK ISSUE magazine. He lives in southern New Jersey with his family. Released in September 1977, the Atari Video Computer System (VCS) was one of the earliest video game systems and is widely credited with helping lay the foundation for what would become a multi-billion-dollar industry. Since its introduction in 1966, the Two Tune Music Box TV from Fisher-Price continues to entertain young children through its ease-of-play and simple design.